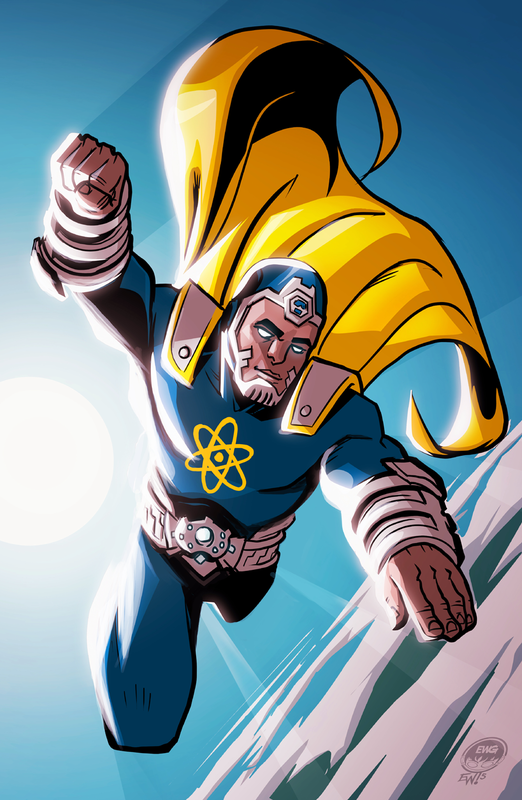 Borrowing a great idea from TnCComics - a better way to follow and get your favorite EWG comic projects in your facebook feed - the EWG Comics Fan Page group. 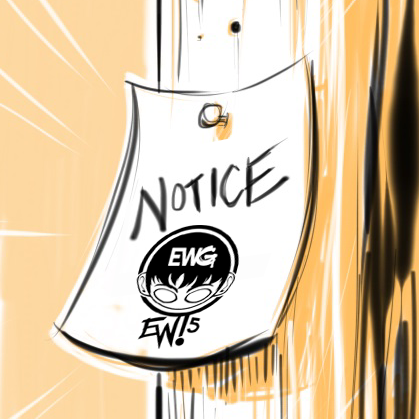 Go follow along, only followers will see the content like special behind the scenes info and sketches on the development of current and future projects related to EWG Original Comics. The comics publish on this site. But the fans, comic production content and feedback will be found on the fan page. Thank you for following along! Follow Eryck Webb and Run Of The Mill at these fine links! Just a quick sketch this morning of a certain Jumping young male. 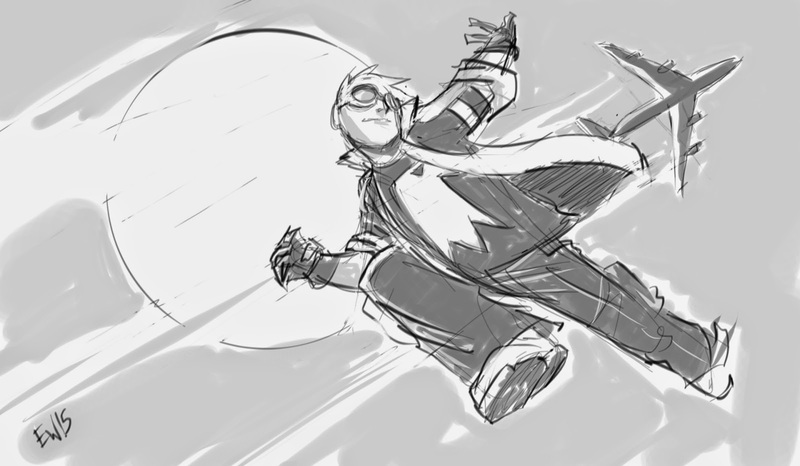 The idea is hes on some airship or bomber or something up high in the sky, and hes the only one able to reach it. Dunno. Haha... costumes kinda craaaazy. Got a bit more work to do on this Friday! Have a good one! Just a cool down sketch for fun after some late night work. Jumping boy flyin high of course! A warmup sketch this morning of 'Spartan' from Troubleshooters, a new comic project I will be working on this year with Andrew Lorenz. Already queued up to do the first two pages but am getting a feel for the characters and such till I start on the pages in a week or two. Got to get a few things off my plate but can't wait to properly put my attention on this project. This is just a warmup, aka a method to get warmed up and in the right mindset to do art/ work all day. Hence the stiff nature of this sketch. But not too shabby. I always like superheroes with blank eyes, in my mind it is a metaphor for the fact that in their costumes/ masks you don't recognize who they are so the eyes make them that much more mysterious. Anywho, he will most likely have eyes in the actual comic cause thats how hes designed. Thank you to Andrew for letting me have a little creative liberties in the character designs. As shown here, I'm basicaly sticking to the established but putting little touches on that I think would be cool, like the subtle tweaks to spartans helmet and shoulder armor. Alright... onto work, have a great Thursday! 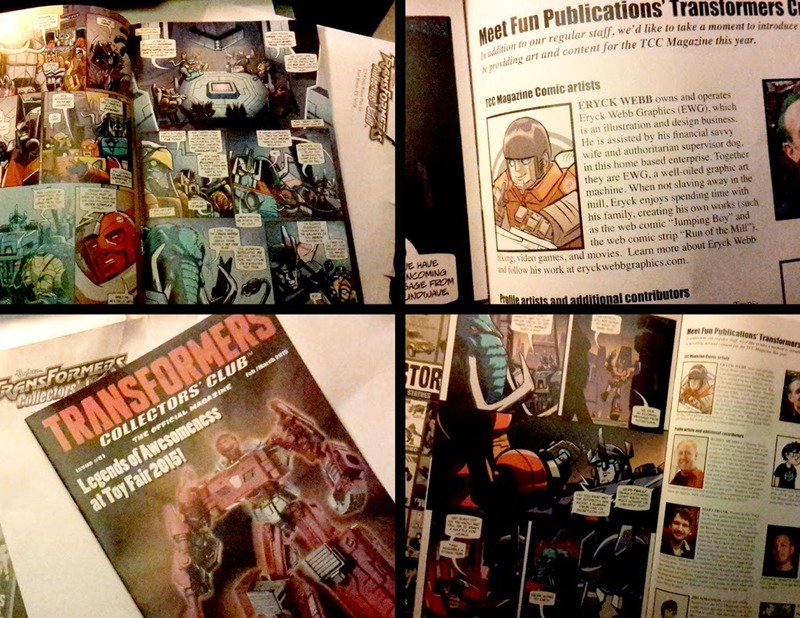 Excited to receive the first sample from my work for the Transformers Collectors Club today! I saw a jpg or two of some of the pages but these all look great in print! 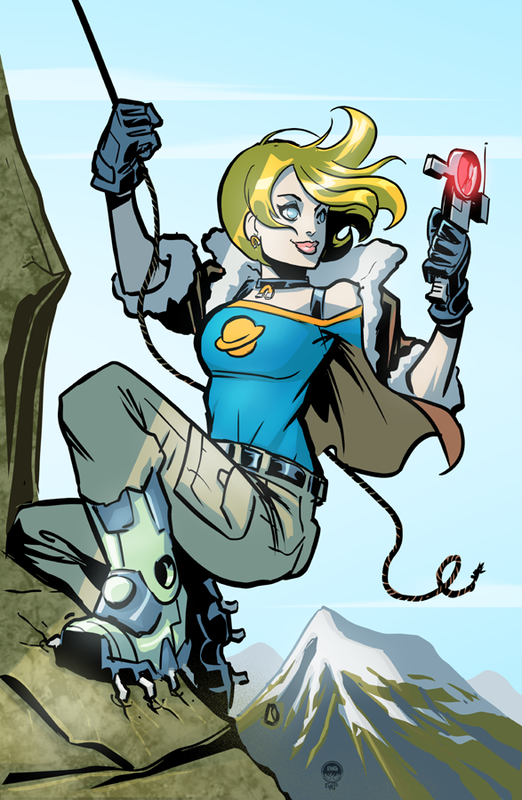 I was commissioned to be penciler/inker and then the colors and letters are done by other artists. It all came together really well. Love some of the creative choices the colorist and letterer went with. Very honored to be featured in the spotlight of the 2015 creative team as well. Hope readers/ fans dig the 'transformer eryck' rendition I did. Thought it was appropriate. Overall hope the regular readers dig my approach to drawing transformers and this comic. Can't wait to check out future samples! Look forward to drawing more transformers! cancelled. There is just too much to do this week. We hope you understand and we will shoot to hold one next week if orders are not backed up too much. It just wouldn't be fair to do a sketch night event when clients are waiting on their orders. 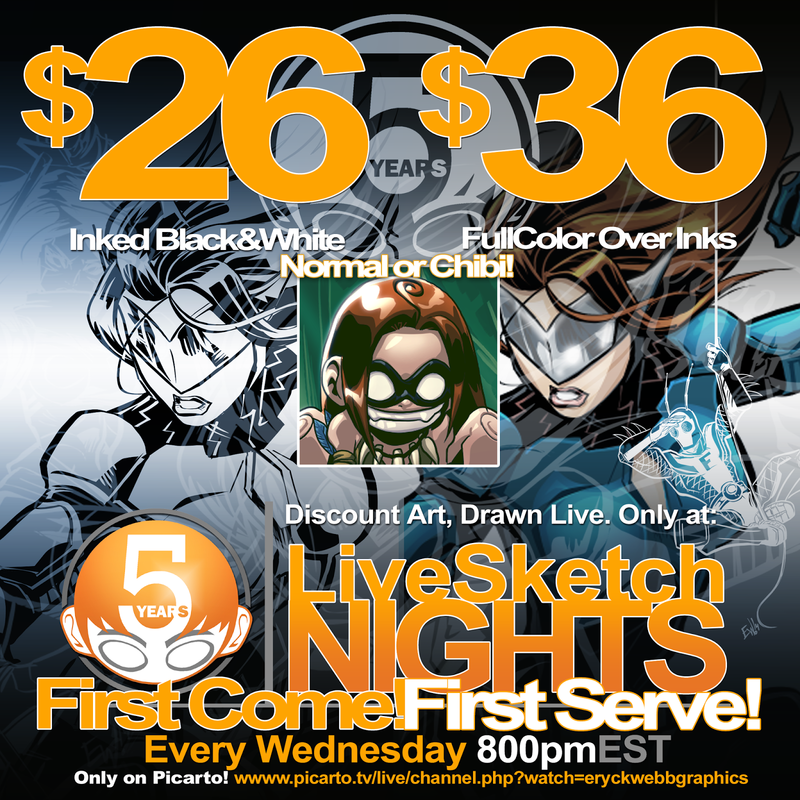 There will be a release posted as soon as the flag is green for more sketch night fun! Second, we are accepting new commissions! We are planning the production schedule and are very busy. We want to give you a full disclosure upfront about the timeline and feel it's irresponsible to take a new commission and guarantee to start it the next week if we really don't have a space for it. Therefore, when you order a commission, we will let you know when work can begin on it. You can decide if you want to save your place in the queue or not. Hopefully start time and overall turnaround will be caught up soon. Until then, this will be the procedure! Thank you for understanding, and please do not be discouraged. Keep the commissions coming, it just might take a little longer to get started on them! Enjoy this brand new Run Of The Mill! Couldn't help the delay, I had it all lettered and penciled but was awaiting inks and colors. So better late than never right? And its still Monday for another hour! hoo hah! Enjoy and see you next week for a new installment! 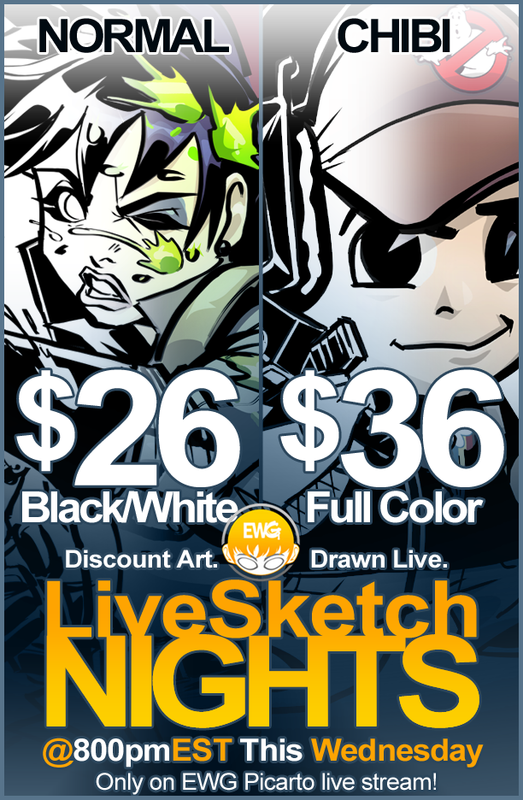 EWG is happy to promote our new weekly fixture, 'Live Sketch Nights'. Now every Wednesday you can come to EWG's livestream at 8pm EST to get a fast, high quality, on the spot art piece of the character of your choice. It can be fanart of a mainstream comic, animation, movie or video game character OR your original creation! We hope to see YOU at this week's event and every Wednesday night!!!! This will be great if you do not want to pay for the high-end publish-quality illustration work but are looking for some high quality fresh exciting character art for your hobbies and interests! All you need is $26 (for inked black & white) or $36 (for full color over inks) per character (sent through PayPal), and a solid reference picture. That's it!!!! be finished by the following Wednesday at the latest. ● Customers also have option to purchase several pieces at their discounted price, but only by coming out to the event and ordering at the event directly. These orders however will not be streamed during the event. They will be done one-a-day until complete. (If there are 5 orders, they will be done by the end of the following week). This week's theme when I get the opportunity to indulge in a 30 min or less warmup, is drawing favorite characters from series I work on. Today, in excitement and honor of the new Ungrounded project starting up on Kickstarter and the fact that I'm working/ have worked on a piece or two already, I thought I'd lay down my new design for Major Freakshow - some 'Thoth'-ish armor, a new haircut and kickass as always. Excited to announce Eryck Webb / Eryck Webb Graphics is in the early stages of working on the new Ungrounded project! 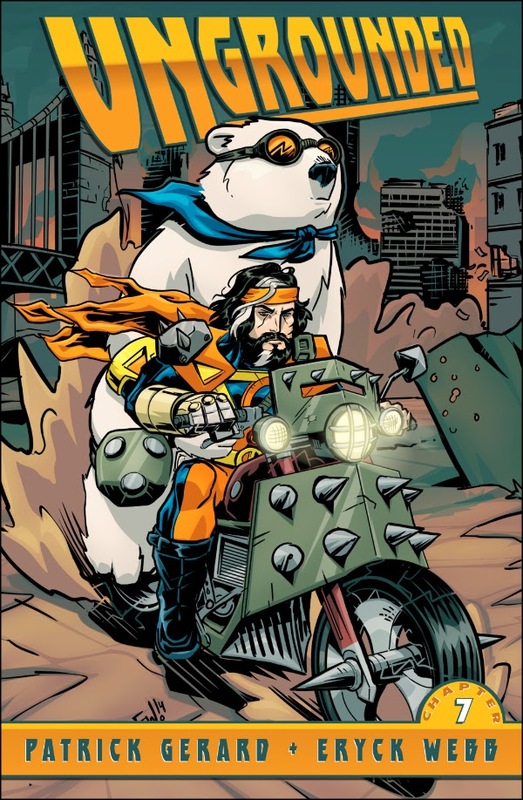 In 2013 EWG had the privilege of working with writer/creator Patrick Gerard on the first Ungrounded graphic novel and this sequel project looks to blow that one out of the water! The new stories have some top-tier writers working on them, and I have the privilege (again) to return and lend my art to those new adventures. I feel I've grown a lot since this first book, so I aim to make that shine through in the new one! Go support the new Ungrounded Kickstarter today! I really want to draw that 15,000 stretch goal story. Ungrounded style post-apocalyptic mayhem!? Awesome! Help spread the word, contribute to the kickstarter or just share it everywhere you can to help get the word out. That in itself is a massive help! Head over to the Ungrounded kickstarter, throw down some cabbage, get some loot! 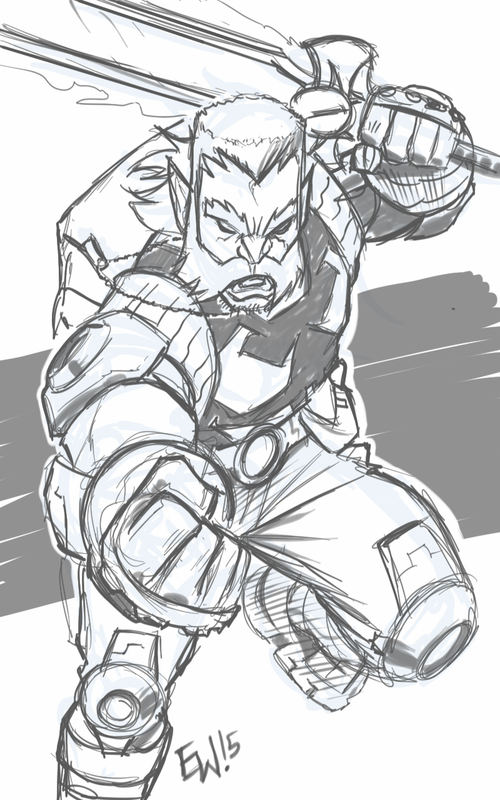 Finished commission of client's OC 'Captain Collider' paying homage to some Superman pose goodness. Was fun and my fav part was a chance to play with this direct lighting and the 'shadow' effects. Really happy with this one and hope the client will be too! Part of a couple things I got done this morning before heading to Pittsburgh for my wifey's oncology checkup today! I'm sure everything will pass with flying colors but doesn't hurt if ya'll send us extra prayers, vibes and happy thoughts of kittens! Work will resume per normal tomorrow. Will get some work done on my tablet at the hospital if I have the opportunity. Wish us luck! And thanks for checking out this piece, be sure to head over to the 'Art Gallery' on the menu at right for all the latest in best client, personal pieces and sketchbook posts! *update*: She passed with fly in colors. Perfect doc appointment woo woo. Presenting a new Run Of The Mill, now with extra teeth! See you all next Monday, same dominating dog channel same dominating dog time! If your enjoying this webcomic please comment let me know your questions, suggestions and reactions in the comments below! Tried something different for a few minutes while waiting for the LiveSketchNight Recap video to render and upload, ironicly, recorded another video. I enjoyed drawing/ streaming this way, though it WAS my first attempt so its not perfect. I will adjust the clarity/ lighting a bit for next time. 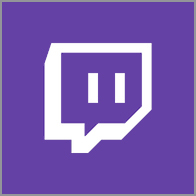 Maybe a fun new way to do a stream on occassion. Or just stream while I draw to draw. In this case was working on a chibi order for Ecto with the mascot of his youtube channel 'Containment Gaming' in a diabolical starwars old republic sith role. Fun stuff. What do you think of streaming me drawing this way as opposed to doing it desktop-view? Sound off below! Thanks for checking this out! Chibi Caricatures, Fan Arts and OCs oh my! Enjoy the recap from this week's super fun EWG Live Sketch Nights installment, and hope to see folks out next Wednesday! Thank you very much to everyone who watched the event and to those who ordered! Just wrapped up this post-live sketch night color upgrade! Did the black and white sketch lastnight during this week's event, and the client, Patrick who I have worked with on Ungrounded, was gracious enough to let me color it today after the event. This allowed me to spend some more time on it in various areas and I think the results came out pretty darn good! If you haven't read our graphic novel 'Ungrounded' now is the time! Just search for it on Amazon, you can't miss it. Theres new stuff in the works so get on board early folks! This is Vivian the world-trekking artifact and strange gizmo collector! Also probably the foremost expert on all weird unexplainable objects that resulted from the creation of the Ungrounded world. We hope to see YOU at this week's event TOMORROW night and every Wednesday night!!!! ● Customers also have option to purchase several pieces at their discounted price, but only by coming out to the event and ordering at the event directly. These orders however will be streamed during the event. They will be done one-a-day until complete. (If there are 5 orders, they will be done by the end of the following week). Head over to Patreon right now and support the kickin web-comic 'Ultimate Teenage Mutant Ninja Turtles' - written by Nick Arganbright and art by Eryck Webb - to get your hands on 5 new wallpapers/prints coming out in the next couple weeks! 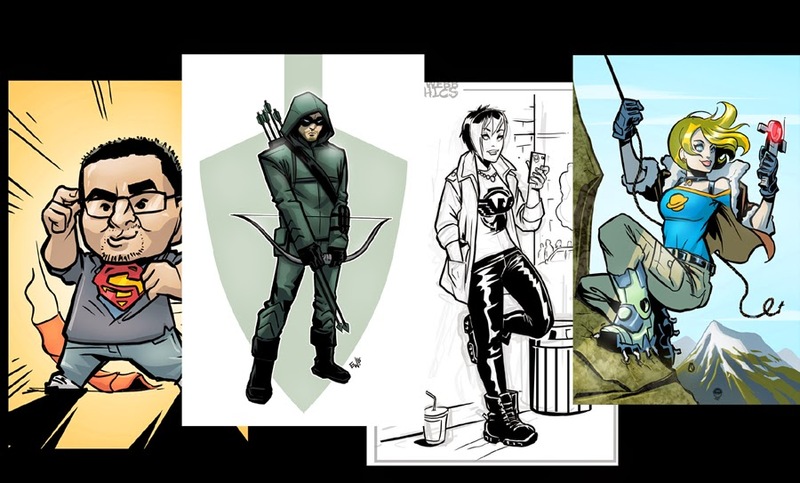 These are 5 original works, featuring each one of the turtles plus one of the group together. These are exclusive to Patreon supporters only! So head to the link below and show some love. Keep this comic going. We're almost at the end of the first issue, but would love to keep telling this original take on the TMNT! If you want to see it in print or a second issue, please help support this comic! Keep the dream alive and the food on the table! A new strip for the first week of February! Remember to leave any comments or questions below, and please take a second to share this comic on all your social media sites. I very much appreciate the support and hope you enjoy reading this. Enjoy the 'making of' video below for this strip! See you next Monday!